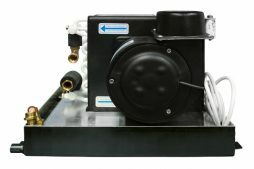 Webasto offers a wide range of air handlers. Our different options and designs fit your individual needs perfectly. In addition to horizontal and vertical layouts, accessories such as bleeder kits or the electronic silencer are available to significantly reduce blower noise. AH-CO05 0.35 11 lbs 4,500 BTU/h 13.4 x 10.2 x 10.4 in. AH-CO06 0.35 16.5 lbs 6,000 BTU/h 17.5 x 10.2 x 11.5 in. AH-CO09 0.57 20 lbs 9,000 BTU/h 19.1 x 11.4 x 13.1 in. AH-CO12 0.65 21 lbs 12,000 BTU/h 19.1 x 11.4 x 13.9 in. AH-CO16 0.87 27.5 lbs 16,000 BTU/h 22 x 11.4 x 14.5 in. AH-CO20 0.87 31 lbs 20,000 BTU/h 22 x 11.4 x 15.9 in. AH-CO24 1.3 55 lbs 24,000 BTU/h 24.4 x 11.4 x 15.9 in. AH-CO30 1.7 53 lbs 30,000 BTU/h 27.8 x 11.4 x 15.9 in. AH-CO48 2.7 88 lbs 48,000 BTU/h 38.3 x 15.3 x 19.3 in. boat air conditioning, Webasto marine air conditioning troubleshooting, marine air conditioning 12 volt, Marine air systems, Marine air conditioning parts, marine air conditioning sizing, marine air conditioning miami, marine air conditioning parts, marine air conditioning miami fl, marine air conditioning service, marine air conditioning parts, marine air systems parts, marine ac, marine air systems parts, small boat air conditioner, air conditioning sale, self contained, Webastoir.